Television’s power to influence our behavior is well understood today. But in the 1950s, when the medium was still exciting and new, few Americans paused to consider how it might affect their buying habits or their children’s perspectives on family relations. Professor Emeritus Francis Earle Barcus, a COM professor of mass communication from 1969 to 1989, was decades ahead of his time. He began studying the social effects of television almost half a century ago, and his two books and several academic papers on the subject were cited frequently by advocates for responsible children’s programming in the 1970s and 1980s. Barcus, who lived in Jamaica Plain and was known to friends and colleagues as Earle, died on October 4. He was 76. 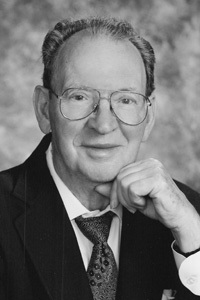 A native of Rossville, Ill., Barcus studied television from the time he was a doctoral student in communication at the University of Illinois in the 1950s, and eventually focused his research on its impact on children. His first book, Children’s Television: An Analysis of Programming and Advertising (1977), was a broad content analysis of children’s programs and featured startling statistics about the amount of violence on TV, how much TV children watched, and how easily advertisements could manipulate them. As an extension of his academic work, Barcus served as a consultant to the Newton-based advocacy group Action for Children’s Television (ACT) during the 1970s and 1980s, and he testified before Congress on children’s susceptibility to advertising. He also was a featured speaker on the role of television in American racial issues at the 1969 World Affairs Council in Tokyo, and was among five international authorities invited to participate in an international symposium, again in Tokyo, in 1984 on how television shaped the perceptions of Japan around the world. In his retirement, his wife says, Barcus enjoyed ballroom dancing, playing golf, bowling, and following professional basketball. He also stayed challenged intellectually, teaching himself to operate and maintain computers, and volunteering to teach a computer class at the Newton Senior Center. In addition, he served on the board of the Greater Boston Senior Computing Group, sang bass in a choir at the Senior Center, and played trombone in the First Corps of Cadets band of Brookline. In addition to his wife, Barcus leaves his sons, Gary and Mark, and their families, including teenage grandsons Dustin, Dorian, and Dalton, all of Boston, and his daughter, Julie Starr, of San Jose, Calif. He also is survived by his brother, Hal, and his sisters, Claudine Rawdin and Connie Mockenhaupt. A memorial service was held at Forest Hills Cemetery’s Forsyth Chapel on October 11. Donations in honor of Barcus can be sent to the Earle Barcus Fund at the Newton Senior Center, 345 Walnut Street, Newtonville, MA 02460. For more information about the fund, call 781-444-1077.